Video call escalation (peer-to-peer) is now supported in forever4035. It works with any webcam that has a Windows driver. The video is encoded on the fly with the TrueMotion VP7 Personal Edition codec which delivers amazing real time video quality even at low bandwith (300 kbps). VP7 Personal Edition is a free version of On2's industry-leading award winning VP7 codec used in Skype. Version 1.3 gets rid of the netmeeting conference capability (replaced by Meeting Spaces in Vista) and can therefore be installed on any Windows distribution. 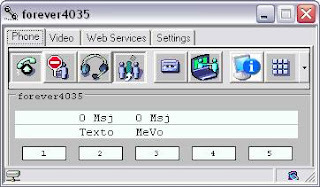 Follow this link to download the forever4035 UA softphone freeware. Unleash the power of the proprietary Alcatel UA protocol and rip out the benefits of computer-telephony convergence. The forever4035 is a full-featured .net emulation of the famous 4035 e-reflexe hardware phone set. In addition it provides a set of API both for first party CTI integration & Softphone integration into business application : design the softphone that suits your own specific needs in your own custom environment!